A new range for the sportsperson, The 1000 Mile Race Sock is an ultra-lightweight, low bulk sock designed for speed and endurance sports such as running and cycling when every gram of weight counts! The socks are made from a special moisture management blend of fibres, including fast drying and soft Tactel, keeping feet cool and dry throughout exercise. 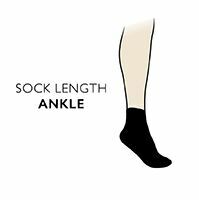 The sock is constructed with vented areas in the foot for superior breathability and air circulation, ‘heel power’ to securely grip the heel and prevent slippage and arch bracing for full support and hold.